I love this statement camo jacket because it’s oversized and the fabric is not too thick but enough to keep you warm–just perfect for Indonesia’s tropical weather. And of course, the eye-catching print! I personally think it’s the best colour for camo.Paired it with a loose tank that I bought from one of my favourite stores in Bali, Somewhere, and my overused brown boots to keep it simple as I wanted to give all the attention to the jacket. ♡I also added this beautiful ivory crochet pencil skirt to stay in touch with my feminine side hehe.. Anyway, any exciting plans for this weekend? Amazing, chic outfit! 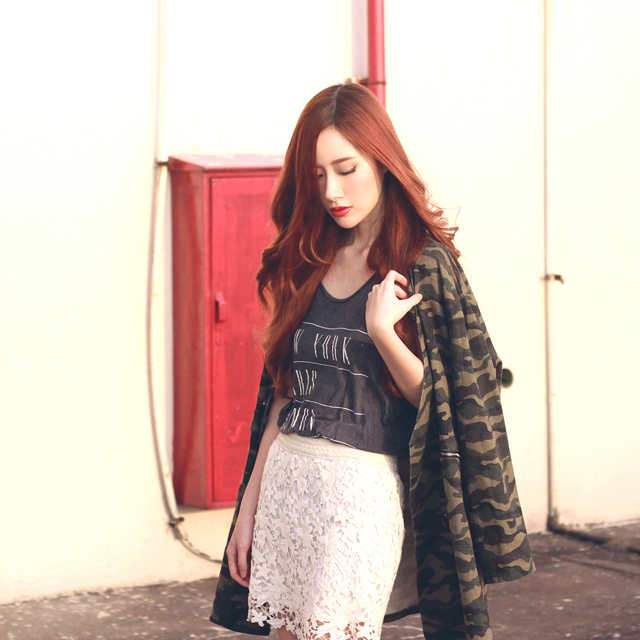 I love the camo cardi the most! i fall in love ** u look really awesome! so pretty, elle! love your outfit, especially the skirt! the oversized outwear is the thing to die for! Pretty skirt and lovely jacket.